Kanako Yaguchi transforms paper into works of art by using the Japanese technique of Kirigami, the traditional art of folding and cutting papers to produce creative designs and patterns. While studying Space Design at Joshibe University of Art and Design, she first began exhibiting her work with Kirigami. Creating mostly florals motifs, Kanoko uses her delicate blooms as a basis for various works of art applied on canvas and beyond... 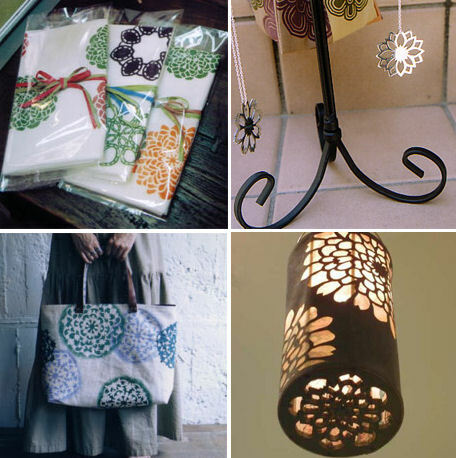 Bringing them to her creations for fashion and home, from lights and boxes to handbags and shirts. Kanako comments on her work, "The concept developed out of my first solo exhibition. From this first small step has arisen not only the name of my brand, under which I create all kinds of pieces, but the theme that lies behind all of my work: the happiness that we can all experience. This happiness can take many different forms, and just as each completely unique shape takes form through my hand, each person has his or her own happiness. I hope you can discover your own happiness through my work." She continues, "Since taking it up around the age of 20, I've been immersed in Kirigami." What keeps her going as a designer? "A huge motivating force for me has been the support and cheer of the people around me who believe in me ? the friends who watch over me, customers who attend every single one of my shows, and my family. Without them I could not have continued to create", she says. Kanako is part of Funtrap, a group of professionals in the fashion and apparel industry that seek to clue people in as to what's happening in the world of Japanese design. They offer products and services to buyers, shop owners and store managers in fashion retail and have a new showroom located at the California Market Center in Los Angeles.